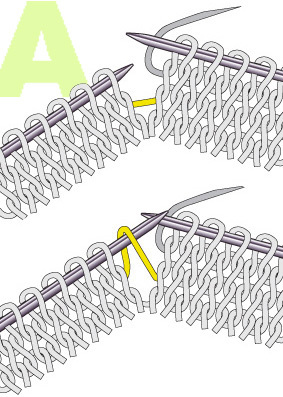 With the left needle pick up the strand between 2 stitches, from front to back and knit through the back loop. 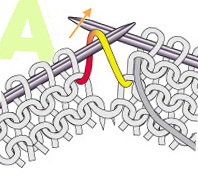 With the left needle pick up the strand between 2 stitches, from back to front and knit through the front loop. This is a little different and a bit more complicated to explain, but once captured, it is very easy to remember. 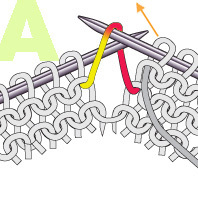 The m1pL (make 1 purl stitch to the left) and m1pR (make 1 purl stitch to the right) are described as seen on the knit side (often the right side of your work). In fact on the purl side it is harder to see a significant difference in direction of both increases. So, m1pL is left leaning on the knit side. Consequently, the m1pR is right leaning on the knit side. 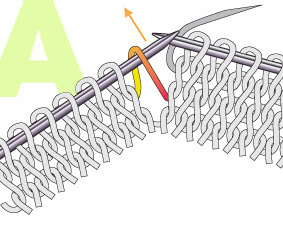 With the left needle pick up the strand between 2 stitches, from back to front and purl through the front loop. 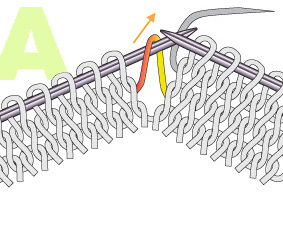 With the left needle pick up the strand between 2 stitches, from front to back and purl through the back loop. As said before right and left in the purl increases refer to the knit side. See how the front leg is pointing to The front leg is pointing to the left. matches a m1R at the knit side. a m1L at the knit side. Now, if you don’t want to hurt your brain with ‘right’ and ‘left’, just think of increases leaning away from or leaning towards a marker and watch the legs closest to the right side which is often the knit side.